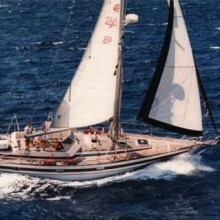 Relaxed and experienced skipper with a strong quality ocean yacht from Sweden. After cruising caribeean we set sail from Florida northbound along US East coast in spring. And later across atlantic west to east, enroute Bermuda, Azores to Europe in may. Or maybe we decide to sail the northern route via Canada, Greenland and Iceland to Scandinavia.